R. B. Laughlin, A Different Universe: Reinventing Physics from the Bottom Down (2005). The current book arose out of papers delivered at a multi-disciplinary conference on the topic held in Spain in 2002. The book offers an excellent introduction to the diverse perspectives on this subject. The 13 authors represent the specialist fields of quantum physics, astrophysics, philosophy, anthropology, astrobiology, psychology, biology, and theology. So, what is emergence? It depends who you ask. Broadly, it’s the idea that the whole is greater than the sum of the parts. For example, the carbon atoms in diamond and in graphite (lead pencils) are identical. Both materials have identical building blocks. But graphite is black and soft, while diamond is hard and transparent. Properties such as colour and hardness cannot be ascribed to individual atoms. Rather, these properties are “emergent”; they are properties of collections of atoms. Consciousness is often given as the ultimate example of an emergent phenomenon. What, then, is the “emergentist hypothesis”? It is a form of strong emergence which first arose in philosophy and is sometimes equated with vitalism. It claims that there are emergent phenomena such as consciousness which cannot be reduced to nor understood in terms of lower level phenomena. Hence, mind and brain are two distinct entities. 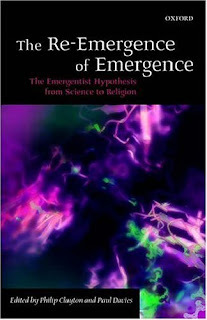 In his excellent introduction to this volume, Philip Clayton describes four key features of this emergentist hypothesis: ontological physicalism, property emergence, the irreducibility of emergence, and downward causation. Weak emergence, on the other hand, is a much milder position. Many scientists (especially in biology, chemistry, and condensed matter physics) would support this position. Essentially, they acknowledge that collective systems have emergent properties that cannot be reduced purely to properties of lower leves. Furthermore, although the principles (e.g., symmetry breaking) which describe these emergent phenomena can be deduced from theories describing the constituents, these principles are in practice virtually impossible to deduce or predict from the lower level theories. Hence, scientific progress is made from the top down. For example, progress in theoretical chemistry is made by formulating emergent principles and concepts (such as aromaticity and electronegativity) from chemical experiments and then seeing how such principles might follow from the laws of quantum physics. Although this volume conveniently brings together work from a diverse range of disciplines, it’s unfortunate that the section on theology does not really present a broad range of perspectives. All three authors in this section (Peacocke, Gregerson, Clayton) offer a perspective that is deeply influenced by process thought, and their concern is mostly with philosophical issues rather than with the actual content of theology. For a different perspective, readers might find it helpful to supplement these essays with Alister McGrath’s account in his recent book, The Order of Things: Explorations in Scientific Theology (2006), chapter 5. Readers may also find it helpful to consider work on emergence by scientists such as Laughlin, Anderson and Hoffmann, as well as other work on emergence in condensed matter physics and chemistry. Such work is not explored in this volume, but I believe it holds significant promise for the dialogue between science and theology.